Dubai is a city which always strives hard for bringing new innovations for the ease and comfort for its residential people. It is ready to willingly embrace the technological future and has just surprisingly introduced the first of its kind electric flying drone taxi with successful test flight experimentation. This fantastic autonomous airborne taxi concept has been executed by the young crown prince who is a son of the ruling king of Dubai and possesses a broad positive vision for the prosperity of this small beautiful city. The core purpose of introducing this flying taxi is to get rid of congested city traffic and provide citizens easy and affordable means of smart urban air mobility transport to reach their destination in less time by avoiding the mess of hectic road traffic for hours. 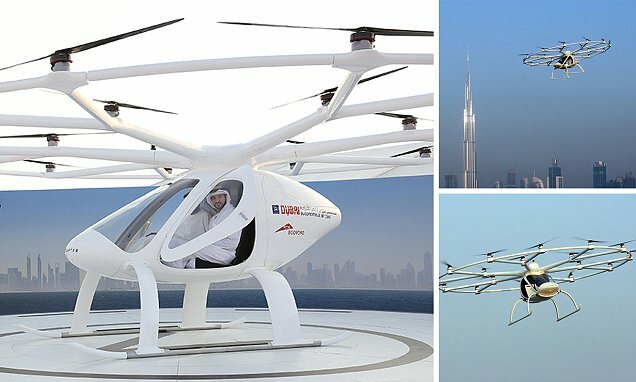 It is a first air taxi project initiated by Dubai in collaboration with German drone firm Volo Copter which consists of a small 2-seater helicopter cabin design operated by 18 flying propellers. It has meant to design for short distance urban travel with time duration of 30 minutes in the sky without remote control assistance. It is also further equipped with backup batteries, rotors, and parachutes for a safe landing. It is vertical takeoff and landing flying object which can fly upwards to the height of 200 meters in the air. Many other companies are also getting into this technology for providing modern autopilot drone taxi concept for customers. These flying cabs will be an upcoming popular trend for giving a true sense of luxury and convenience for customers. Dubai has set the new milestone by pioneering the flying taxi design with an aim to progress in modern technological innovation in all over the region.